Why does a Californian Muslim student group need to condemn a terror attack 6000 miles away? 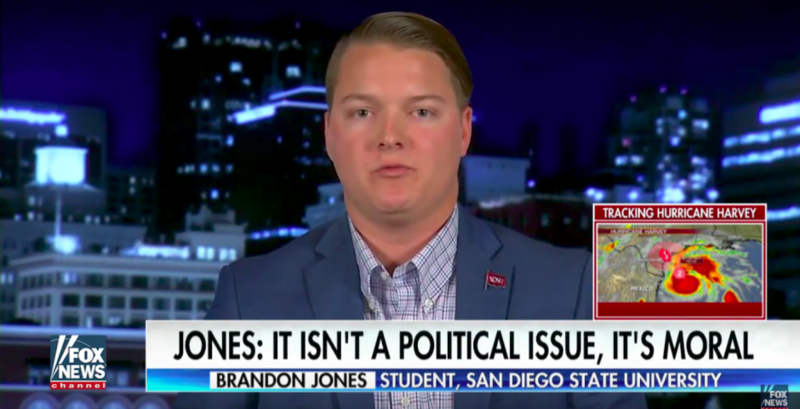 The contender for the greatest dumbass of the 2017-18 academic year has already emerged, and his name is Brandon Jones of San Diego State University. Context: Brandon, who went full Galaxy Brain last week, asked the Muslim Students Association at San Diego State to denounce terrorism in Barcelona. "These acts of violence must not only be stopped, but disavowed by Muslim leaders on our campus in our community," he declared. His group of College Republican dunces demanded student Muslims "publicly condemn" these acts or else "resign immediately." Brandon claims he wanted to "expose the left wing indoctrination that conservative students are battling on college campuses," and the anchors duly commend him for being such a big brave boy. "I sent them a letter simply asking them to condemn the violence in Barcelona and boy did they flip out," he explains. "The funny thing is they're more worried about a letter I wrote than radical Islamic terrorism." Then he complains about "a couple threats via text messages and phone calls saying I better watch my back and that I've turned the campus into a war zone." Things must get really dire when, as the persecuted head of the College Republicans, you get invited on your favorite TV show to be praised about it. Ignore for a second how braindead you need to be to want students in San Diego to denounce something that happened in Barcelona, a city which is over 6000 miles away. What a group of teens in Southern California could have to do with European "radical Islamic terror," ( a phrase beloved of constipated news anchors), is beyond me. This is Islamophobia, pure and simple. But push all that aside and call this for what Brandon's letter and subsequent TV appearance is – a publicity stunt. This is Brandon's chance to put his first paw up the greasy pole of Fox News appearances, where simpering anchors can fawn over how much of a True American Patriot you were for standing up to those cruel liberals. See you on Fox News soon!